This is an easy and delicious dish you can make when you want something pasta-ish (cheesy, saucy) but don’t want pasta. I don’t eat pasta at all so this recipe is a great substitute when I’m hanging out for some comfort food that won’t give me a tummy ache afterwards. It’s fairly light, especially if you use low-fat ricotta, and really tasty. The original recipe called for spinach, but I can’t eat that so I use chopped, cooked kale instead – works exactly the same in this dish. Couldn’t be easier – just mix all the ingredients together until combined, roll the mixture into walnut-sized balls (this is the messy, fiddly bit), roll them in a little flour to prevent sticking, and then drop them into boiling water. The gnudie will float to the surface when done (approximately 5 minutes or so). Serve with some tomato sauce and an extra sprinkle of parmesan if you like. I like a little side salad to go with it (but then I have a little side salad with everything. Here, I have used rocket because I am obsessed with the stuff) but you could pair it with anything you fancy. This recipe serves two piggly-wigglies. Ah, soup. I am such a fan. It is easy to prepare, does not require difficult-to-get ingredients and can be whipped up in a matter of minutes (depending on the soup). It’s filling, without being fattening, and can be flavoured and bulked-out with just about anything you have lying around the place. Just bung it in, blend it up and hey presto! You have soup. Or some weird-flavoured water (depending on the “anything” you bunged in). 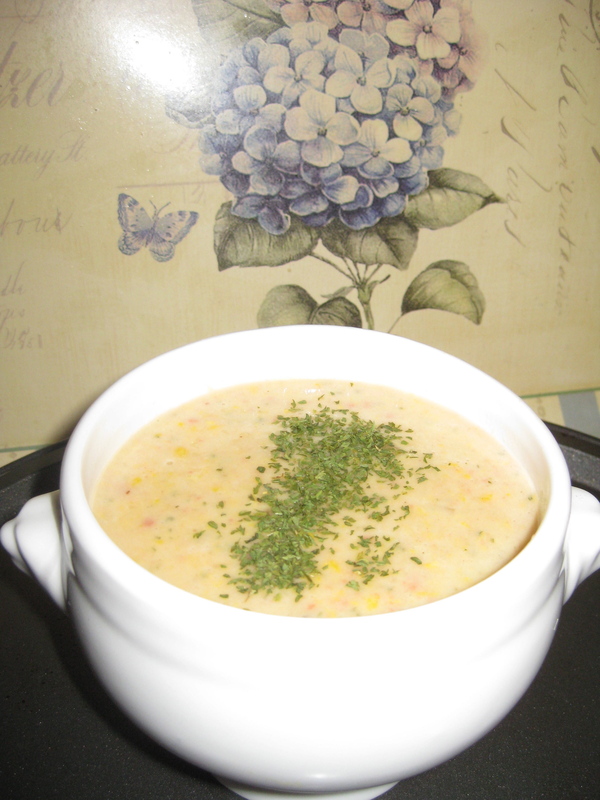 Tonight I had a hankering for corn chowder. I don’t know why. It just appeared in my brain and took hold and made me desire its smokey, corny goodness beyond all other food stuffs. I don’t make it very often. Pretty much never. The first time I ever made it was in catering class in high school. I think I have made it three times in my entire life. But it’s so yummy! And filling and satisfying and feels like a meal rather than some sort of dietary punishment. It never looks very attractive though. Corn Chowder resembles, at best, dog vomit. In fact, I hesitated when naming this blog post. I wanted to call it “Corn Chunder” but I am far too mature for such a title. I apologise if you are eating right now but, seriously, was there ever a more unattractive looking soup? So my photo below is another fail. I’m not even going to bother blaming it on bad lighting (even though the lighting in my kitchen is rubbish). Let’s just ignore the picture and get on with the taste. It’s yummy. Delish. Tasty. So here’s my recipe. As always, for all my soup recipes, it is a bit approximate in terms of amounts used. Again, just bung it in. I have, as is necessary for me, made this vegetarian, but substitute (if you must) real bacon etc. Saute the onion in a bit of oil (I used sunflower) in a large saucepan until soft. Add bacon and fry for a minute (don’t let it brown). Add milk and extra cans of water (with stock and flour). Bring to a gentle boil (keep your eye on it) and add potato. Keep stirring – the milk can burn or boil over so keep it simmering rather than rapid boiling. Keep stirring for about 10 minutes until potato is tender (but not super squishy). Add corn kernels and chopped parsley. Continue simmering for about 5 mins. Take off heat and take out a ladle or two of the chunky bits. Give the remaining soup a bit of a blend with an upright stick blender (or whatever you have). Don’t puree it until it’s smooth – this is supposed to be a chunky chowder! Add the removed ingredients back into the pot and stir. If it is too thick for your liking, you can add a half-cup of water if you wish. Serve hot in bowls – garnish with parsley if desired. Firstly, a warning. The photo below is not good. It does not look appetising at all. I apologise. As per usual, I tried to take a photo at night, in my little kitchen with barely any lighting. 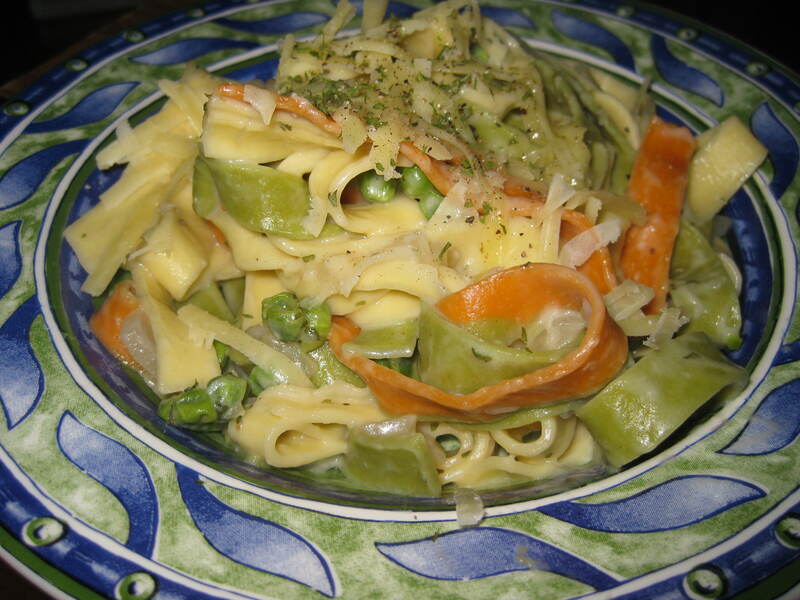 Secondly, I tried to do that cheffy, twisting-the-pasta-around-artfully-on-the-plate kind of thing. Which, blatantly obviously, did not work. Fry onion, chilli and garlic gently in a little olive oil in a saucepan. Don’t let onion brown. Add zest from the lemon and juice of half the lemon. Stir to combine. Add the single cream and heat quickly to prevent splitting. Mine did a wee bit (mostly because I cheated and used milk instead of cream…duh) but came back together once I’d mixed it through. Add the cooked pasta and stir through. Season to taste with salt and pepper. Serve with parmesan and parsley sprinkled on top. Serve hot. Oh, and I added the baby peas (cooked) at the end to add some more freshness and colour. Voila. Pretty easy. Give it a try if you’re looking for something different to the usual pasta and tomato-based sauce combo. I’m still resting at home and trying not to eat everything in sight, but obviously failed tonight. Sigh. Will try again tomorrow and only eat things that are green and crispy. 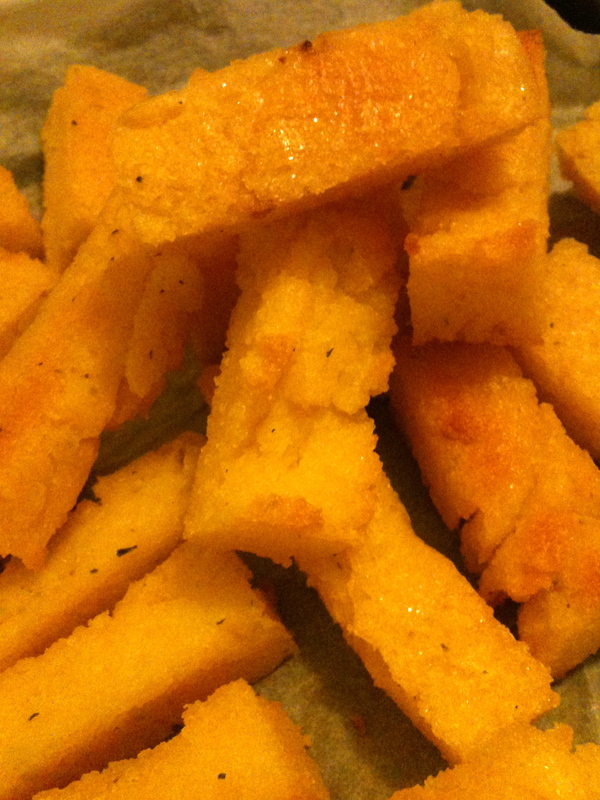 So, as I mentioned in my last post, I tried a new recipe for dinner last night – Polenta Chips! Ok, so it’s not a new recipe – every trendy restaurant and pub is making them these days – but I haven’t made them before, not being a polenta fan usually ( I think I just have had some so-so ones in the past). Anyway, I am always looking for something I can have other than chips as I am not supposed to have a lot of potato (including sweet potato – ahh! So unfair!) because of my renal issues. I don’t have chips very often, obviously, but it would be nice to have another alternative that is tasty and not too unhealthy. Method : Bring the stock to the boil in a medium saucepan then add polenta, stirring briskly to prevent lumps. Take off the heat, add butter and cheese – stir until smooth. Mixture will thicken and be quite firm. Turn out into a 20cm square baking pan lined with baking paper. Smooth top down to make it nice and even and flat if possible. Chill in fridge for 30 minutes. When cold and firm, cut polenta into “chips”. Season with salt and pepper if you like (the stock I used had plenty of flavour so I didn’t need any extra seasoning). Fry in a pan with a little oil until golden on all sides. Serve! I don’t fry anything if I can help it so I actually did mine in the oven – baked at about 200 c for 40 minutes or so – which of course takes longer but gives a nice crispy finish and less guilt ha ha. PS As per usual, I took bad photos in the equally bad light of the kitchen. This one is the best of the bunch.